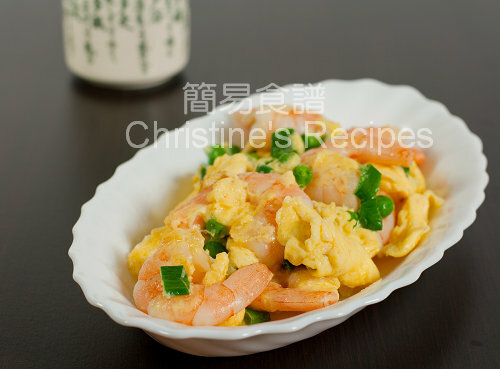 This homey dish, Stir-fried Prawns with Eggs is very popular in Chinese restaurants. It's so quick and easy to make at home. Best of all, it's absolutely tasty. The prawns/shrimps used must be very fresh. Although I can’t find any live prawns here, the frozen, raw ones are still good for making this dish. This dish is like cooking scrambled eggs with prawns. 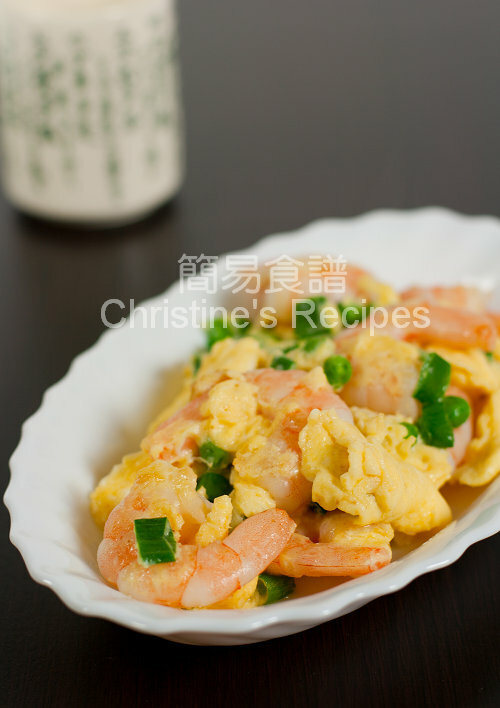 Both of the smell and taste of the eggs with prawns are so good and tempting. No wonder many Chinese people love this dish. This dish looks simple and easy to make. But frying smooth and silky eggs needs some practices and experiences. Is there any trick to help? I learned a little trick from my father to cook smooth scrambled eggs. Just add a bit of milk into the beaten eggs, yet not too much, as you don’t want the eggs too runny. Most importantly, the eggs cannot be overcooked. Rinse prawns and wipe dry with kitchen towels. Mix with marinade well. Set aside. Beat eggs with milk and season with salt. Soak frozen green peas with boiling water for 3 minutes. Rinse with cold water. Drain well. Sprinkle a pinch of salt. Heat oil in a frying pan or wok. Add prawns and cook over high heat, until colour changed. Toss in green peas. Quickly stir fry for 1 minute. Dish up and add into the beaten eggs. Add some more oil in the pan. Pour in the egg with prawns and peas. Use a pair of chopsticks or fork to quickly stir the middle. The egg begins to come together in the middle. Move around the pan to spread the egg evenly. Sprinkle spring onion. When most of the egg is cooked, gently stir to combine all ingredients quickly. Don’t overcook the egg anyway. Dish up and serve hot. The prawns and eggs are cooked so nicely! You have such a soft touch. Looks delicious! I made this too but I added snipped chives (didn't have any spring onions) it gave it a lovely light oniony flavour! Looks great! But hope I'm not being offensive, the picture also leads me to think of the very delicious 蝦仁炒蛋. I've seen this dish in Chinese restaurants - and always wondered how they managed not to overcook the eggs - thanks for sharing your Dad's secret. Love this! Simple and so good with rice! Yes. Agree. A classic. It seems simple but I know it needs some skills and experience for the egg to turn out perfect! Oh snap! I made this just last week (except without the peas) and it was so good that I am craving it again. I really admire your bilingualism. I keep seeing these amazing Chinese cookbooks but I have no idea what they are saying. So I just drool and sigh. Sigh. In my family we often add tomatoes! quick question...can i use regular flour instead of cornflour? For making this dish, cornflour/corn starch is better than regular flour. How much cornstarch do we need to use? Are you asking about the cornstarch used in the marinade? A simple, hearty dish Christine! Is the wine you mentioned a rice wine? If yes could we substitute with mirin? Thank you! Shaoxing wine is a premium rice wine. Mirin has got other seasonings except alcohol. You can use mirin instead. It's not harm if you like. Actually it's not that we like mirin too much, it's just that we don't have any other choice:) Shaoxing isn't available here in Athens, Greece. Thank you very much for clarifying Christine!